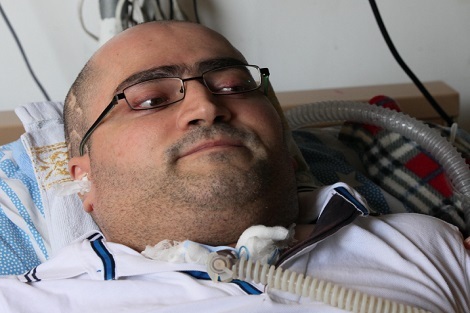 Over more than twenty years on Khaldoun’s injury and became paralytic, but those years did not pass in vain, desperate, unable or giving up hope to an destiny incident. But in spite of his stay in the bed with his electric respirator. Khaldoun Senjab was able to make his life fill with creativity and achievement and the challenge to be a symbol of steadfastness against his disability through his tongue and his lips, he wrote his name by light and knowledge, he became one of the most creative prominent Syrians. Khaldoun founded his own company of computer programming and protection. He was able like any guy to marry, to buy a house and has a decent living. But the “war ” … those damned war , brutal and indiscriminate which opened all the closed doors to their owners, and they did not distinguish between the old and the child , unforgiving of any child or woman … and even Khaldoun suffered of this war, like his counterparts who has special needs . In 2013 Khaldoun left his home in Ain Tarma in Damascus . Under the weight of the war it would have been impossible for him to stay there , because regime’s army surrounded the city and cut off electricity and communications from the city of Khaldoun . The electricity, telecommunications are important factors for the Khaldoun to survive. And when these factors are lost, he must face his death inevitable. He went to Lebanon with his wife and his daughter with the helping of his friends to find himself facing cruelty of being a refugee after his fled from what threaten his life in Syria, but he didn’t find the better situation in Lebanon. 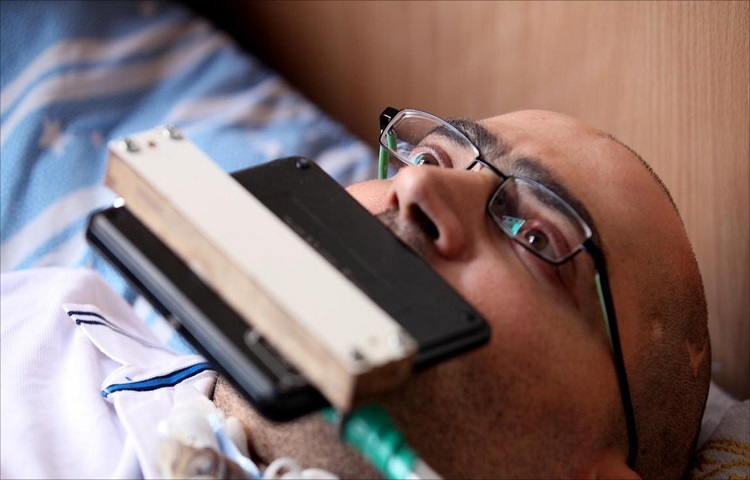 Because of frequent cutting off electricity in Lebanon that led to breakdown his breathing device forcing his family to use hand- held device to pump air to Khaldoun in order to preserve his life. As that of the internet, it is has an important role in Khaldoun’s life, because he depends on internet entirely considering it as a source of earning a living for his family and we can consider him as a sole breadwinner for his family. almost the door of hope is slammed in the face of Khaldoun, and glimmer of light is grasping for breath after the rejection of his case at UNHCR in Lebanon considering his case does not correspondence with its criteria for resettlement in a secure country which will admire and respect his knowledge, providing and giving him security. In addition he has a lot of faithful and loyal friends who are believe in his ability and his creativity, and they didn’t know desperate at all. Today his friends are launching a campaign for helping him through “Afaz” website calling to gain right for Khaldoun to get resettlement in Britain. Support Khaldoun, participate and put your fingerprint at happy end for one of remarkable person in Syria.